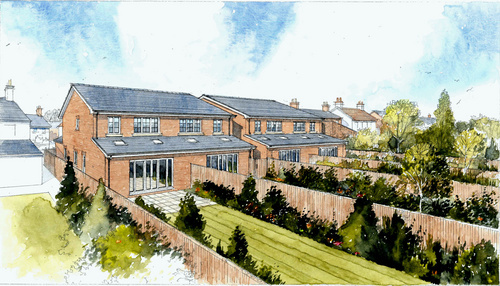 Work has commenced on 4 new build properties on Station Road in Croston, a small village to the West of Chorley. The new 3 bedroom family homes are being constructed by Lanley Homes, and will be arranged as two semi-detached blocks. Lanley Homes was founded in 1988 to provide a range of small scale housing developments and one off individual bespoke homes. The company has undertaken a number of new builds with the most recent development of 2 prestigious stand-alone bespoke homes at Farington Lodge Gardens in Leyland. The new homes in Croston will come with the benefit of 2 off road car parking spaces each, and are above average size for 3 bedroom homes extending to approximately 1,140 sq ft. The additional floor space has allowed the provision of a traditional internal hallway, together with a separate front room. There is a modern open plan kitchen, dining, and living space to the rear of the property with views over the extensive gardens, which are close to 28 metres in length. The houses also include en-suite to the master bedroom featuring a large sized shower cubicle. The 4 new homes will be completed for occupation in early summer 2016 and are being marketed by Armistead Barnett, with an asking price of £234,950. For more details please contact either Neil McManus at Lanley Homes on 01257 238555 or Armistead Barnett on 01704 895995.